Thanks to all of our members who displayed their trees and also to those who volunteered as docents. 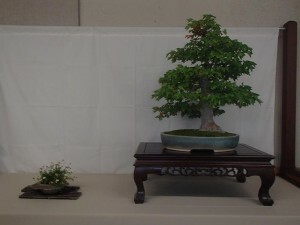 We had a very successful show with 35 trees, and we received many compliments from bonsai enthusiasts and from the general public walking through. Thanks to our daily demonstrators: Michael Jonas on Saturday, Peter Macasieb on Sunday, and Frank Yee on Monday. They had a full audience each day and did a great job sharing their expertise. Co-founder Jim Barrett provided his vast expertise in judging and critiquing the show trees. Thank you Jim for your help again this year. The sales table had a large variety of items and a good number sold. One item in particular, the “Hobbit House”, custom made by Kathy Boehme, got a lot of attention. Kathy donated the entire sales price back to the Club. Thanks Kathy. We appreciate your generosity of both time and money. Thank you to all the members who showed up to help with set up and those who stayed after for the take-down. It goes so quickly when there are enough people involved with this important task. Marilyn Tyler once again, provided all of our awards. She was there to get the results of the judging, took photos, rushed home, made the awards, and returned the same afternoon to place the awards with the winning tree displays. Thank you, Marilyn, for your work and your support. Finally, a very special thanks to Marge Blasingame. As always, Marge was there all day, every day. She handled the sales table and tracking totals for each sales participant. She bought the food and drinks to feed us and managed anything and everything else that needed to be done. It is impossible to imagine putting on the show without her. 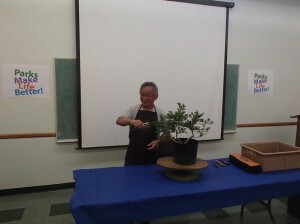 Roy Nagatoshi conducted a workshop at our May Meeting. He provided advice and/ or worked on every tree members brought in. It was a great opportunity to move our trees to the next step in their development. 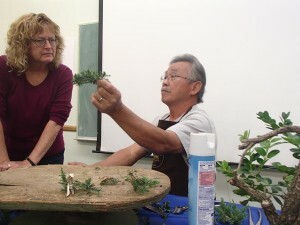 Roy talked about shearing the long foliage needles on prostrata junipers. Cutting the needles in half will cause multiple buds to break rather than getting one bud if the needle tip is pinched back. Roy uses volk oil to combat spider mites, but warned against using it in hot summer months. We had a good learning experience and Roy donated his demonstration fee back to the Club. We appreciate his advice and his generosity.